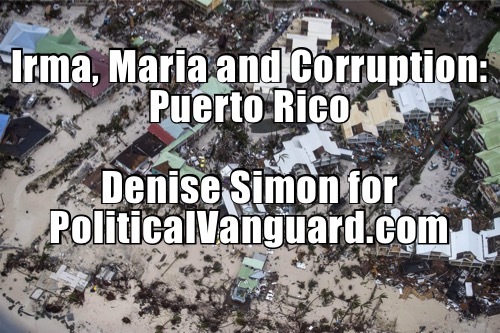 Irma, Maria and Corruption are a trifecta of issues for the island nation. Over the years, Puerto Rico has voted for independence. It is a vote meant to set the stage for Pueto Rico to become the 51st state of the United States. It just won’t happen due to countless underlying issues. Sadly, many civilians are suffering this very moment in Puerto Rico due to two catastrophic hurricanes. They have not only destroyed homes, they virtually destroyed Puerto Rico’s infrastructure as well. Even before the hurricanes, however, the tiny island was on life support. Last year, the island suffered a massive blackout after a fire broke out at one of the island’s main electricity plants, leaving half of the territory’s residents in the dark. While natural disasters have underscored the problems of the island’s electrical system, over the past few years the island’s and the power company’s money problems made the power grid particularly susceptible to crippling damage by storms. Making matters worse, consider the FBI and cyber experts’ investigation regarding the power condition. Then comes working with Puerto Rican government officials. That too is a challenge due to corruption. The NY Post offered in part this item: Jorge Rodriguez, 49, is the Harvard-educated CEO of PACIV, an international engineering firm based in Puerto Rico that works with the medical and pharmaceutical sectors. The Puerto Rican-born engineer says he has dispatched 50 engineers to help FEMA rehabilitate the devastated island — a commonwealth of the United States — after Hurricane Maria. He refuses to work with the local government, which he called inept and riddled with corruption. If a lack of electricity isn’t problem enough, there is the clean water issue. You know – the staff of life. Ever wonder how and island nation does not have a desalination and water treatment system? Singapore has become a world economic leader in part because it has embraced desalination. The sophistication and technology is widely available for production of up to 50 million gallons per day. The high cost is always associated with the environmentalist who scream about algae, fish, marine life and other possible destructive consequences, but you can bet if there is no water, their voices run silent. Going back as far as 1998, Princeton University published a white paper explaining the benefits, costs and reliability of this technology. Glad you asked. Due to corruption and fraud within the ranks of law enforcement in Puerto Rico, James Tuller Cintrón was chosen as superintendent of the Puerto Rico Police Department. Cintron came from NYPD. There are 18,000-members in the PRPD. Under the Obama administration, the Justice Department’s pledged in July $10 million to the Puerto Rican government to combat police corruption, extrajudicial killings and civil rights violations. The deal was the culmination of two years of tense negotiations that focused on reforming the territory’s plagued law enforcement agency. The cash infusion followed a DOJ report, released in September 2011, which found evidence that the Puerto Rico Police Department (PRPD) violated the Constitution and federal laws by using excess and unreasonable force, making unconstitutional stops, searches and arrests, and targeting individuals of Dominican descent, among other problems. In 2017, seven people including some government officials were arrested for stealing $10 million in government funds mostly from the education division. In 2010, the FBI launched a sting called Operation Guard Shack. 750 FBI undercover personnel were flown to Puerto Rico as part of this sting and it resulted in 89 law enforcement officers and 44 other people being arrested and indicted as part of a two-year undercover investigation into 125 drug transactions. Puerto Rico is a major shipping point for drugs between the East Coast and such South American countries as Colombia and Peru. Now, of course, the American Media is focused on the President’s response to the latest two hurricanes. The biggest critic of the mainland response to the hurricane devastation has been the Carmen Cruz. She is the Mayor of San Juan. So, where is she when it comes to FEMA coordination, conference calls and following all disaster planning? Incredibly, the answer is absolutely nowhere. Other mayors from the island participate and collaborate with FEMA, the military and the Red Cross, but lil miss Cruz seems to be notably absent. She literally has failed to attend the meetings. She has, however, found time to appear on televisions to complain. For all the fears due to catastrophic disasters, including lack of communications, lack of power due to power grid destruction and fleeting supplies of water, there are major opportunities that have been overlooked and not exploited in Puerto Rico. Now is an excellent opportunity to use the island as an incubation center for clever and resourceful solutions that include alternate forms of power including wind and solar. Surely after all those taxpayer loan guarantees by the Obama administration for solar companies, there are some panels and battery systems sitting available. When it comes to communications, surely there are some U.S. naval ships that are out of commission and dry-docked that could have or should be converted to communications centers, floating hospitals and even housing for the most vulnerable. As a result of hurricane Harvey, Irma and Maria in 2017 and the lessons learned from hurricane Katrina, there are many regions of the United States that still need to be innovative, clever and insightful when it comes to disaster recovery and the responsibility does not always fall exclusively with FEMA. Individual preparedness is not only useful but required.